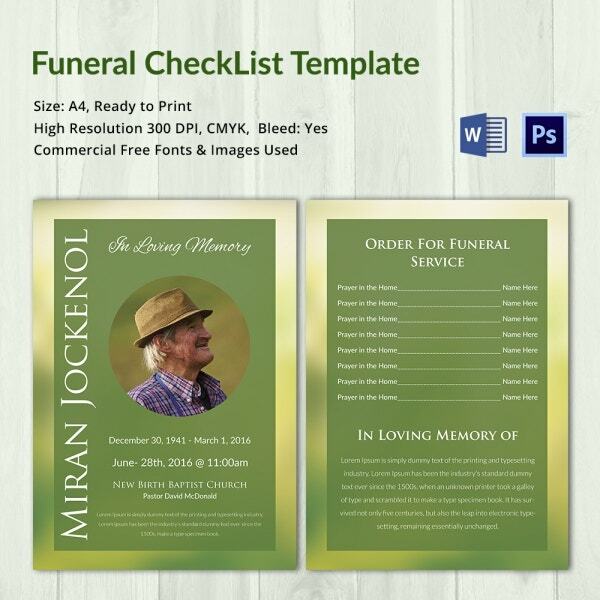 Funeral checklist template helps in creating funeral program leaflets easily and quickly. One can make simple modifications to the template and create a funeral program in a swift manner. They provide all the relevant details of the deceased person and announce the date, time and place of funeral program. They also provide prayer details during funeral program by mentioning each item like scripture, prayer, etc. To know more about these templates one can search Google using “planning your funeral checklist”, “burial arrangements checklist”, “preparing a funeral service”, or “to do list for planning a funeral”. You can also see Funeral Template. This funeral program checklist template announces the name of the person deceased, his period of existence, and funeral timings as well as place of funeral. It comes with A4 size and printer ready format. It uses commercial fonts and CMYK colors. 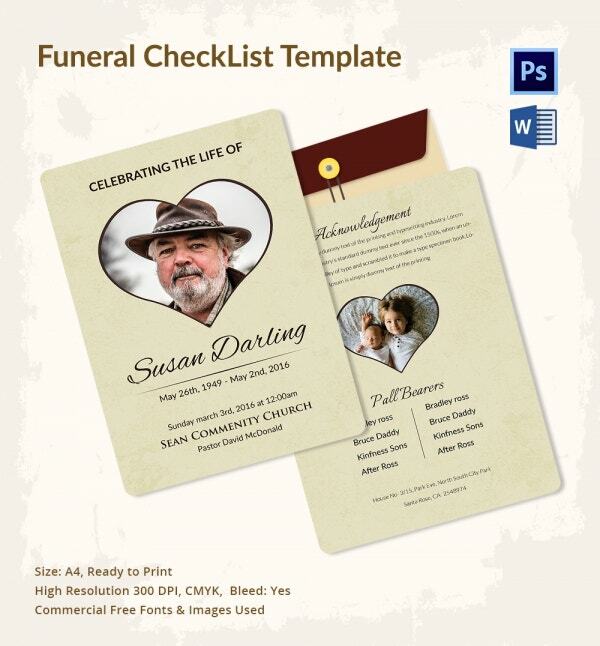 This funeral planning checklist template displays the person’s name, photo and his date of birth and death. It also gives the details of funeral date and timings. It comes with high resolution and printer ready format. 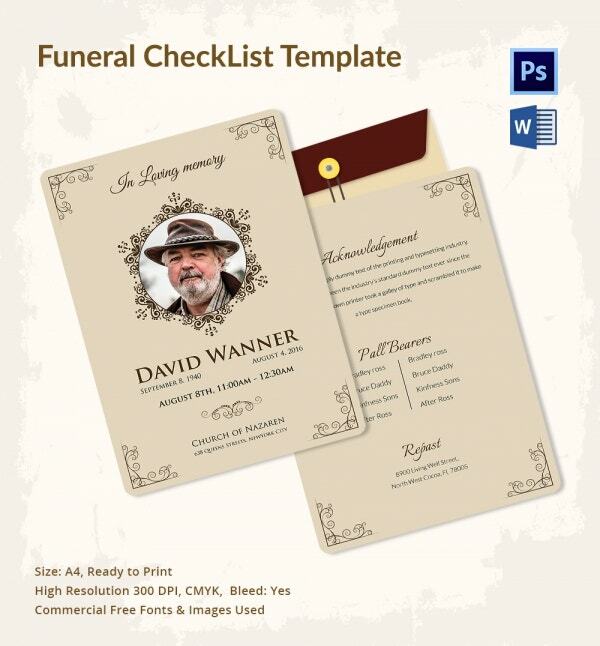 This printable funeral checklist template produces the name and existence period of the deceased person and funeral program details that are to be held at the church. It comes with A4 size and high resolution. 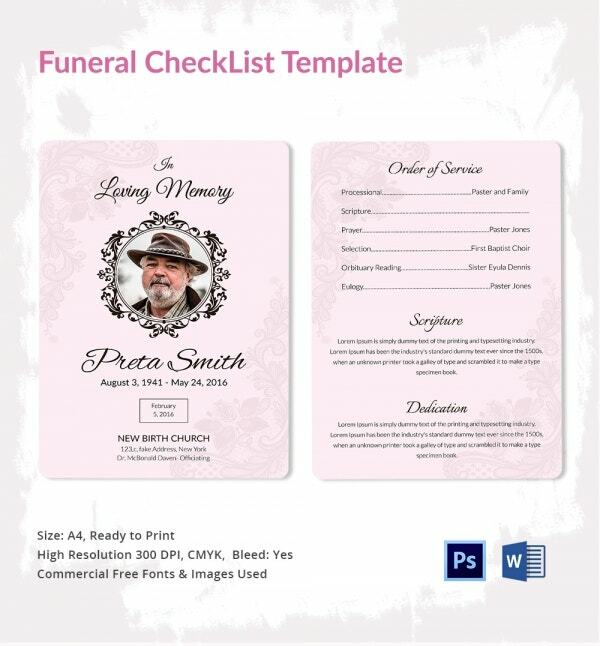 This printable funeral planning checklist template gives the name of the deceased person as well as his date of birth and death. It gives the funeral date and time as well as details about funeral program. It comes with commercial fonts and images. This funeral checklist template shows the deceased person’s name, period of existence and funeral program date as well as time. It comes with names of the people who are going to perform prayers for the program. It comes with A4 size and printer ready format. > What is Funeral Planning Checklist? Funeral planning is the process that one should arrange the items before death. Though the family members will be emotionally stressed during this time, some of the relatives or close friends can help to arrange the funeral planning checklist. 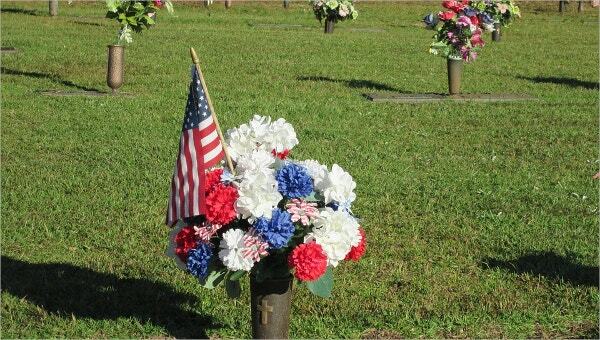 Some of the important arrangement required is the record the correct name of the person deceased, obituary information, burial arrangements, arranging cremation container, information to be given to the church, prayer details, inscriptions, reading scriptures and flower arrangements for the final journey. Other items like arranging death certificate, dead body preservation and memorial register entry are also equally important. These arrangements can help in carrying out funeral program without any hitches. > How to Select Best Funeral Checklist Template? 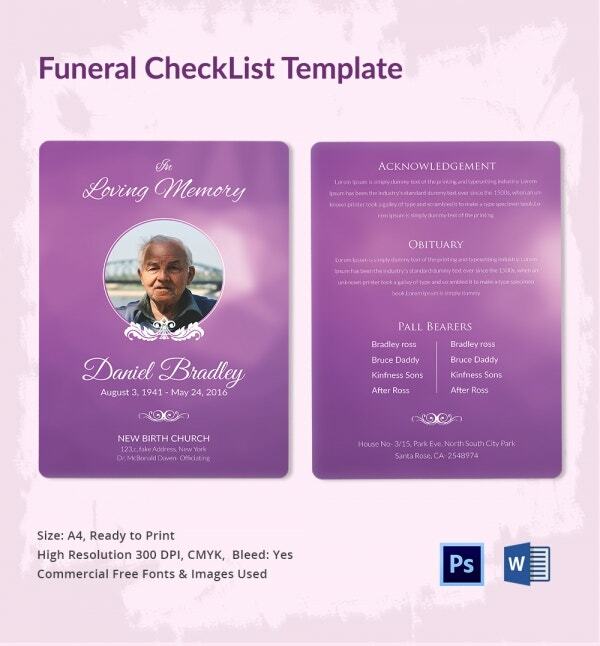 With many varieties of funeral checklist template being available, one should carefully select the ideal one according to their needs and customs. The checklist should contain all the relevant items that are required for performing funeral program as well as arrangements that are to be made prior to funeral session. They should include even items like obtaining doctor certificate, arrangements for death certificates and burial ground. You may also see Funeral Booklet Template. These sample checklists provide all important information with regards to customary funeral programs that are to be performed at the church, funeral procession, burial arrangements, etc. They should be modifiable easily and should come with printable formats. One can select free funeral checklist template and need not spend any money. These funeral checklist templates come in handy for the family members to perform the customary rituals smoothly and help in making peaceful journey for the deceased person’s soul as well. They can be easily customizable and printable. They also help in preparing funerals with high precision and leave no chance for disarray.